While I have night time skincare regimen sorted, as I prefer using oils during that time, it's the day time regimen which becomes quite a task in order to pick up the right cream for my skin type. I am a very picky person when it comes to choosing a day cream for my overly dry winter skin because I do not use commercial skincare products anymore. My search ended when I came across Aloe Day Cream by Venustas Essentials. 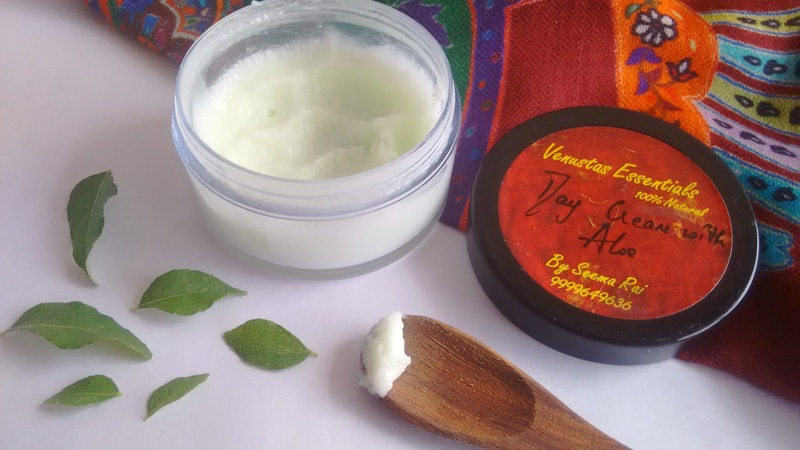 VE is a Pune, Maharashtra based brand spearheaded by Mrs Seema Rai who painstakingly handcrafts body butters, day cream, scrubs, soaps etc in her kitchen. Some of the products that I have used from the brand have given me good results (you can search 'Venustas Essentials' on the blog to read the reviews). I mean seriously, her products are SO good and chemical free, of course. While the night creams repair the skin while you sleep, it is equally or rather more important to use a good quality Natural day cream. As it is during the day that your skin is exposed to maximum pollution, Sun and stress that damage the skin and lead to skin discoloration and premature ageing. This all Natural, non-greasy Day cream has been specially formulated for warm summer days. With Hydrating and rejuvenating Aloe, cool Cucumber extracts and potent essential oils like Sandalwood, Carrot seed and rose hip that protect, hydrate and rejuvenate your skin all day. Aloe, Shea Butter, Cocoa Butter, Vitamin E, Rose, Sandal, Virgin Coconut Oil, Almond Oil, Blend of Essential Oils. I am on my second jar of the cream and that says a lot about it, right? I first got this cream in the month of July and me and my mother loved it a lot! It has a relaxing cucumber aroma (due to the presence of cucumber EO) which is mild and calming for the senses. I cannot stand overly scented skincare products. I just can't. The cream comes in a 50 gm pot with an inner lid to protect the contents. I have been using this cream consistently since July and this cream is such a rockstar. It literally sinks into the skin and provides just the right amount of moisturisation to my overly dry skin (I had combination skin during July-Oct and it didn't cause any flare-ups) without feeling heavy or leaving an awful greasy residue behind. The presence of aloe soothes the skin immediately. And guess what, the surprise element of this cream is, the lovely dewy finish it gives a few minutes after it's application. Expect a healthy glow as well as unbeaten moisturisation for up to 8-10 hours (this is coming from someone that has overly dry skin!) before your skin screams for moisturisation again. I love my essential oils and this cream contains rose and sandalwood EO alongside aloe which make it all the more special. According to various researches, rose EO contains certain therapeautic compounds that promote healing. Rose EO also defines skin texture and tone. Whereas, sandalwood EO helps soothe the skin, relieve inflammation and irritation. Aloe vera is a great moisturiser! It soothes, softens the skin and is loaded with anti-bacterial and antioxidant properties in abundance. There are two important things which I would like to point out - 1) It does not replace sunscreen as it contains no SPF. 2) It didn't do anything for the dry patches as mine are more of an hormonal issue. Provides adequate amount of moisturisation. Has a relaxing aroma of cucumbers. Won't bother sensitive noses. Contains a potent blend of oils. Lightweight and leaves no greasy residue behind. The cream is priced at INR 300 for a 50 gm pot. Orders can be made on brand's official Facebook page HERE or their WhatsApp number +91 9999649636. Have you used this cream or any product from Venustas Essentials? Let me know in comments below.